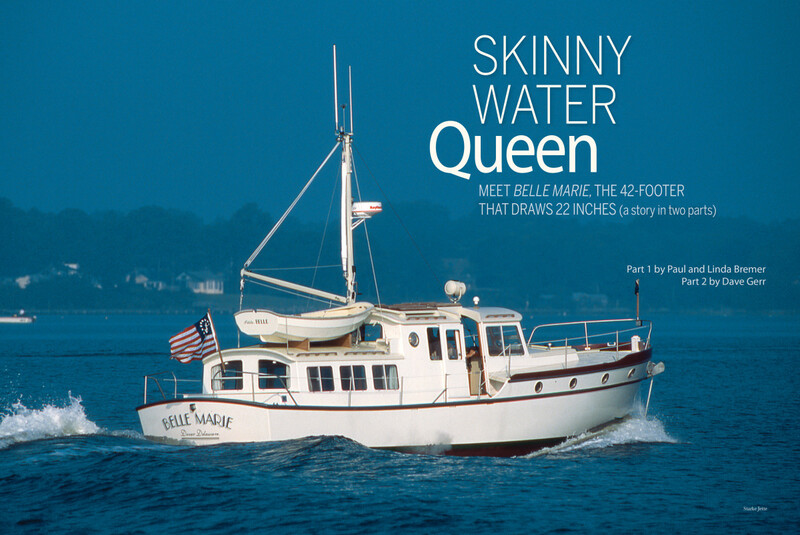 Get to know Belle Marie, a 42-footer that draws just 22 inches of water, from the hearts of her owners and the eyes of her designer. Uniquely designed to be the queen of the shallow waters. In 1994 we were still looking for a new boat. 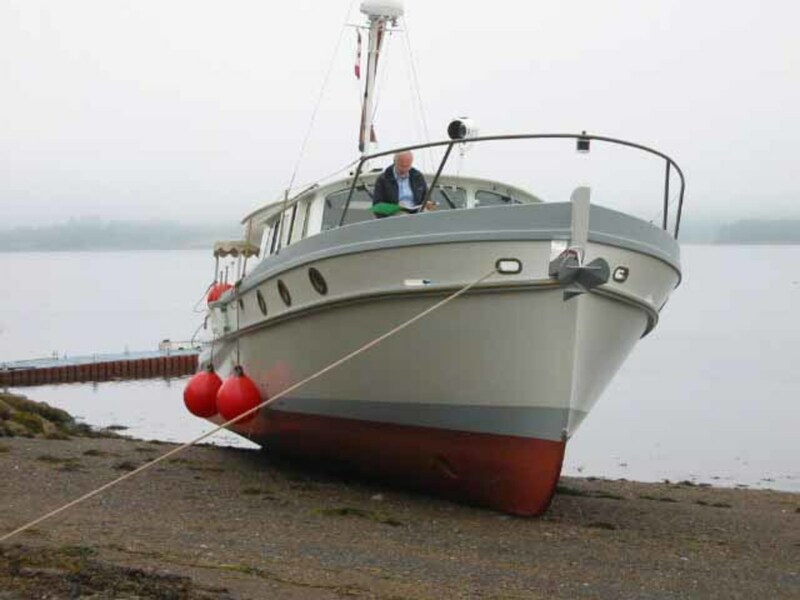 Our beloved Albin 25, which we had cruised on for 22 years, had become too small and Spartan for our aging bodies. 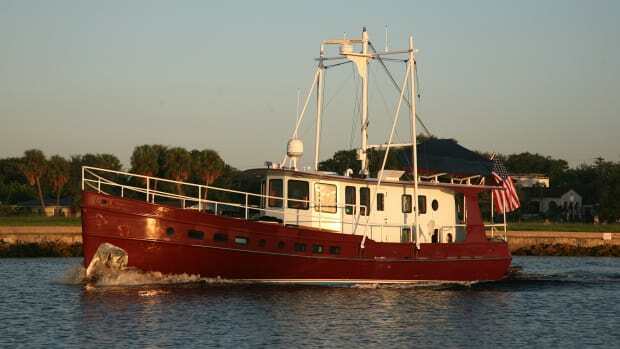 In her we had discovered the joys of shallow water cruising and had thoroughly explored the Abacos, the Keys, coastal Georgia, the inland waters, and both coasts of Florida, but we needed a larger and more comfortable boat for our retirement years. We looked at the usual range of trawlers, but found all of them to be too enclosed, too complicated, with too deep a draft and interiors best described as teak caves. The “power cruiser” types seemed to be designed to display bikini-clad figures while speeding from one marina to another, not for enjoying being on the water. What to do? 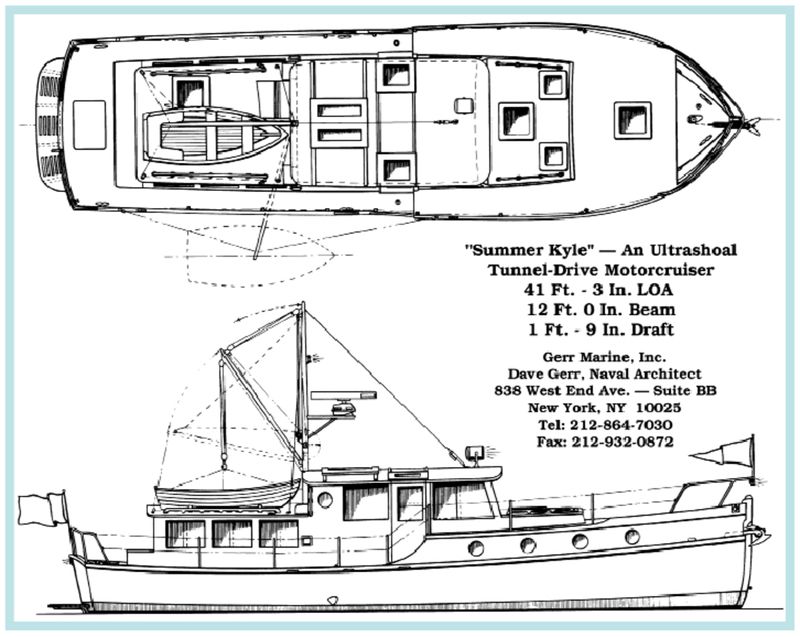 Luckily, in a copy of WoodenBoat magazine, we found a review of Dave Gerr’s Summer Kyle design written by the late Joel White. It seemed at the time—and later proved to be—ideal for us: super-shallow draft, airy cabins with lots of big opening windows, a big galley, and room for guests. Classic styling—a happy result of the need to keep the center of gravity low—was a plus. We had some meetings with Gerr to explain our style of cruising and some minor changes were made in the equipment and layout of the design. Doubling the size of the battery bank and having bigger water tanks accomplished our goal to be self-sufficient for two weeks. We did not want to have to use an outboard motor and carry gasoline; a Joel White Nutshell Pram dinghy took care of that. A hard dinghy is a great luxury. Having a super-shoal draft boat also meant that we could usually anchor very close to where we wanted to go. A generator was an unnecessary complication for us, so refrigeration and water pressure were all 12-volt; hot water and cabin heat were from the engine cooling system. Twelve-volt fans took care of cabin cooling aided by the large hatches and windows on which we soon installed screens. We also wanted a 6-cylinder, slow rpm engine rather than the 4-cylinder, high rpm engine in the original design. A 6-Series Cummins was squeezed in and was unfailingly reliable. As for maneuverability, a bow thruster obviated the need for a second engine. 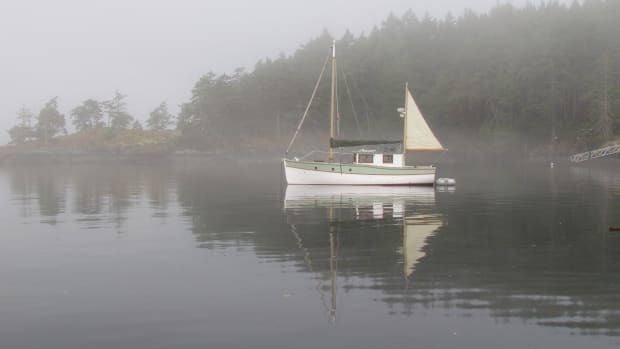 Both Belle Marie and Petite Belle, the dinghy, were built by Covey Island Boatworks in Nova Scotia and we proudly took delivery in June of 1996. What followed were many happy years of exploring all of the shallow waters from the C&D Canal to the Steinhatchee River in Florida’s Big Bend. Having a 42-foot boat that draws 22 inches of water when fully loaded led to some funny incidents and a steep learning curve for new docking techniques. Super shallow draft has some interesting advantages in a cruise boat. We could always find a spot in a crowded anchorage just by going into the shallow spots where no one else could go. In a rough or windy anchorage we could always find shelter by pulling close up to the lee of the shore or an island. There was always a shallow slip left that no one else could use when it was time to go to a crowded marina. Shallow draft can also create some funny problems too. We discovered that modern, digital depth sounders will not read depths of less than 2½ feet below the sounding head. Since ours was mounted at least 1 foot below the water line, it would cut off when we still had all of 3 feet of water below us. When the water is thin, we are interested in how shallow it is, not how deep it is. Besides running out of depth soundings we also found ourselves running off the charts. Our electronic and paper charts were all of the Intracoastal Waterway and the Chesapeake Bay. Exploring some of the winding rivers in coastal Georgia and South Carolina, we would run completely off the charts. It was an even bigger problem when we explored Whitewater Bay in the Everglades and didn’t have the riverbanks to guide us out. We had to get directions from a group of passing canoeists who were a bit startled to find a 42-foot boat on a canoe trail. Being able to go far off into these uncharted areas was one of our great joys and we have fond memories of watching undisturbed wildlife on the shore and being surrounded by flocks of migrating geese and ducks taking shelter with us in the marshes. We usually moved seasonally, spending late spring, summer, and early fall somewhere on Chesapeake Bay and winters below the snow line in South Carolina, Georgia, or Florida. The 10- to 14-day cruises between the Bay and a southern base and back again were among our favorite times on Belle Marie. We often stopped at familiar anchorages each time—there is always something interesting to see on the waterway. We have seen deer swimming across rivers, Peregrine falcons perched on markers, and amphibious military vehicles crossing the waterway during exercises. Poking into shallow, uncharted places made running aground a regular, but never serious event. 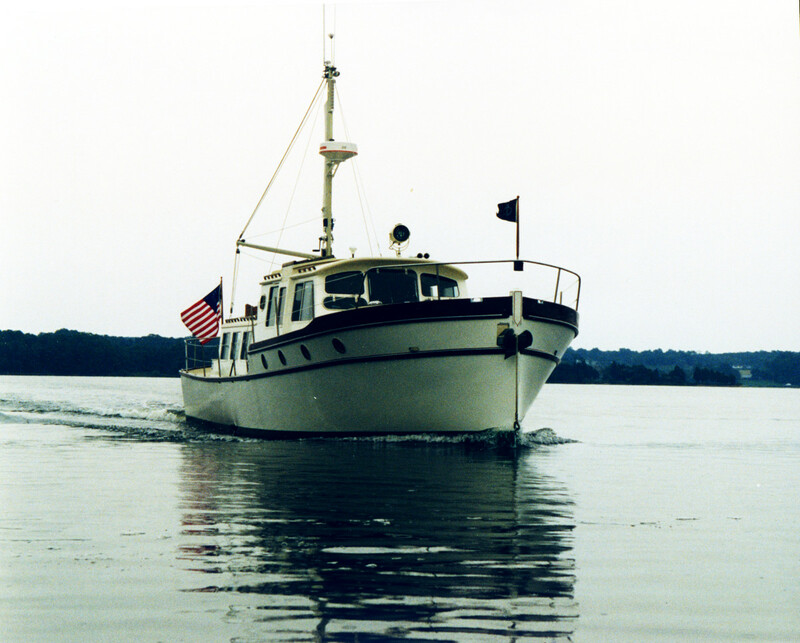 Since Belle Marie had exactly the same 22-inch draft at the bow as at the stern, the stern was usually in deeper water and made backing off easy. On a few occasions it was necessary to take an anchor out in the dinghy and use the windlass to pull off a hard bottom. We did have one potentially serious “grounding” incident. We were passing behind Myrtle Beach, South Carolina, through the notorious Rock Pile at high tide. Overconfident about our shallow draft, I moved toward the shoreline to give room for a tour boat that was coming the other way. Suddenly the stern squatted and we struck hard on one of the limestone outcroppings that give the area its name, coming to a complete stop in about 4 feet from 9 knots. Before I could reach the throttle to stop the engine our stern wave arrived and washed us completely over the rock. Protected by a 3/8-inch thick stainless steel plate covering two inches of laminated plywood and a solid bronze skeg protecting the propeller and rudder, nothing resulted but hurt pride and some bruises from the sudden stop. We frequently had the experience of well-meaning people trying to warn us that we were about to run aground. They would wave wildly and point us away from disaster, then stop and stare when we proceeded without incident. We had the chance to return the favor one hot summer’s afternoon when we had anchored in less than 3 feet of water just at the mouth of Onancock Creek on the Eastern Shore. We had been wading around the boat on the hard sand scrubbing the sides in the sun. When we finished we both sat down in the water to cool off. After a few minutes we saw a sailboat motoring confidently in our direction, anchor at the ready. Since only our heads were above water they must have assumed we were swimming and there was good depth. When we stood up, the water was just above our knees, and we waved them off. There was a good deal of shouting and arm waving on the other boat, but a grounding was prevented. It must have been quite a shock. When we were under way and the tunnel that made up the last quarter of the hull was full of water, the unique hull form performed as well as a deeper draft boat. The sharp chines toward the stern acted as fins and made course holding, even in following seas, stable and accurate. Going into head seas was another matter. Because the bottom of the hull was flat, it would pound badly in head seas and throw spray everywhere. We learned to tack like a sailboat going upwind, which helped greatly. But when we stopped to dock, and the tunnel emptied out water, handling became unique to say the least. Most boats have their deepest draft at the stern, so the bow blows downwind in a cross breeze. Belle Marie had the same draft at the bow and stern, but had the most boat above the water at the stern, so the stern would blow downwind instead. She would also blow sideways very quickly when there was very little hull in the water. Luckily, the big rudder and powerful bow thruster could compensate for these quirks once I had unlearned previous docking techniques. There were some tense and embarrassing moments until this happened, though. Chesapeake Bay was by far our favorite cruising ground. Usually regarded as an ideal place for sailboats, we found that it was also wonderful for shallow water cruising. For several years we based in Urbanna, Virginia, on the Rappahannock River. Later we moved to Mill Creek across the Patuxent River from Solomons Island. On the Eastern shore there are hundreds of miles of navigable rivers and creeks lined with farmlands, nature preserves, and small, interesting towns, among the earliest settlements in this country. On the mainland side are rivers and creeks lined with high bluffs that lead to historic cities. We explored them all from Chester River in the north to James River in the south. Summer Kyle was born when a consummate sculptor in wood, and a world-renowned martial arts champion came to my office about designing an economical cruiser that he and his wife could cruise extensively for a month or two at a go. He wanted classic styling, and he required less than 24 inches of draft. Why? Because the berth behind his home had as little as 22 inches of water at extreme low tide. 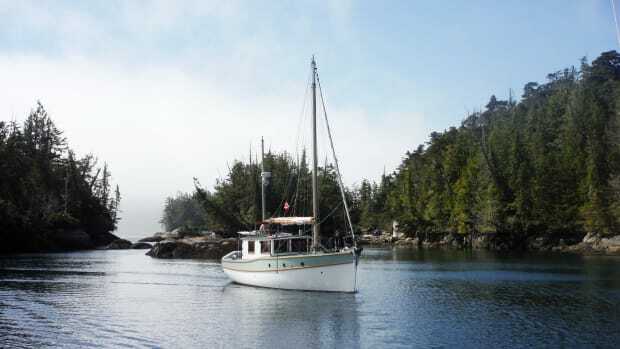 He also found, like I have, that the most interesting part of cruising is poking into all those diminutive shallow bays and inlets, nosing up creeks, and squeezing over sandbars. Some rough sketching and discussion of arrangement and machinery lead to the conclusion that he needed a vessel a bit over 40 feet LOA. The question was how to achieve such shoal draft. 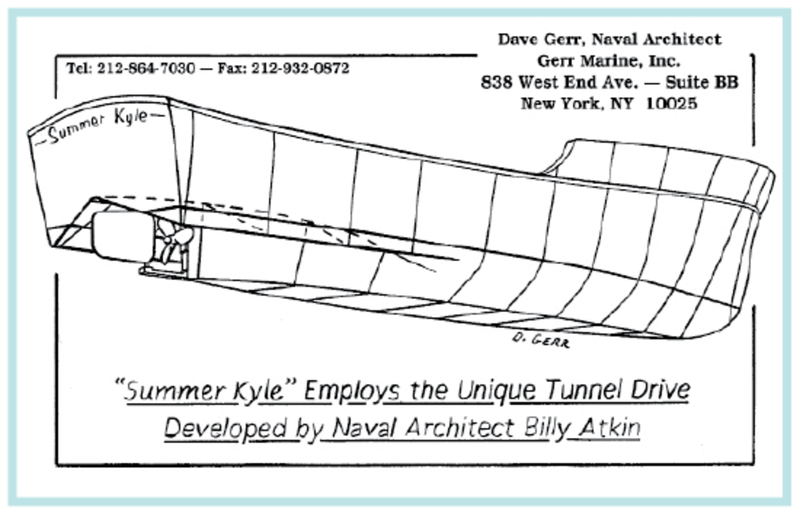 It was then that I recalled reading about a tunnel-drive hull form developed by naval architect William “Billy” Atkin. Dreamed up between the two World Wars, the hull is a modification of the New Jersey Sea Bright skiff. Atkin designed and built at least seven different vessels on this model (perhaps as many as two dozen) and all were successful. Looking at the perspective view sketch of the hull, you can see how this unusual hull is shaped. Basically—instead of a single centerline tunnel directly in line with the prop—two semi-tunnels flank the keel aft. These sweep up and astern toward the centerline, funneling water efficiently to the prop. At the same time, the full Sea Bright Skiff box keel is retained for maximum propeller and rudder protection. With the hull form worked out it was on to other considerations. A paramount requirement was light and air below. As you can see from the photos, there are plenty of windows and plenty of hatches too. 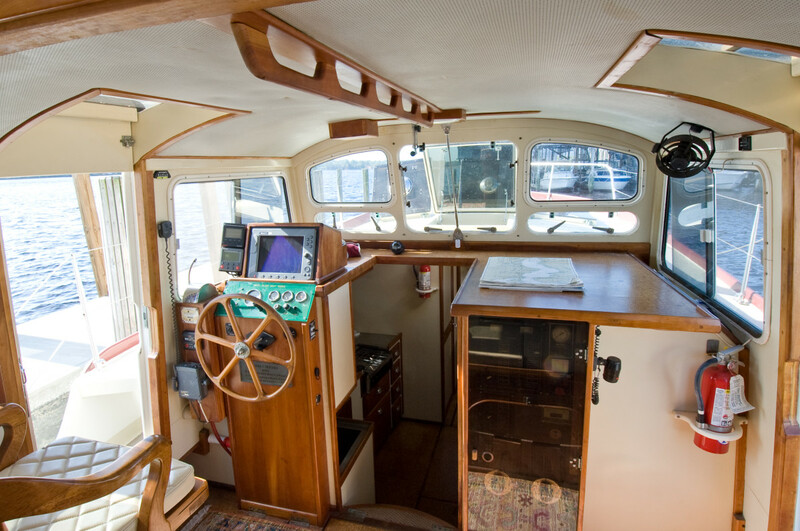 The wheelhouse in particular opens wide with both a sunroof and two side companion slides and sliding doors, and all of the front and side wheelhouse windows open. The original client for Summer Kyle had some business delays and temporarily dropped out of the project. The Summer Kyle design, however generated more interest than any other boat ever drawn in my office. Paul and Linda Bremer thought she was just right for the sort of cruising they’d been enjoying for years aboard their old but trusty 25-foot Albin. 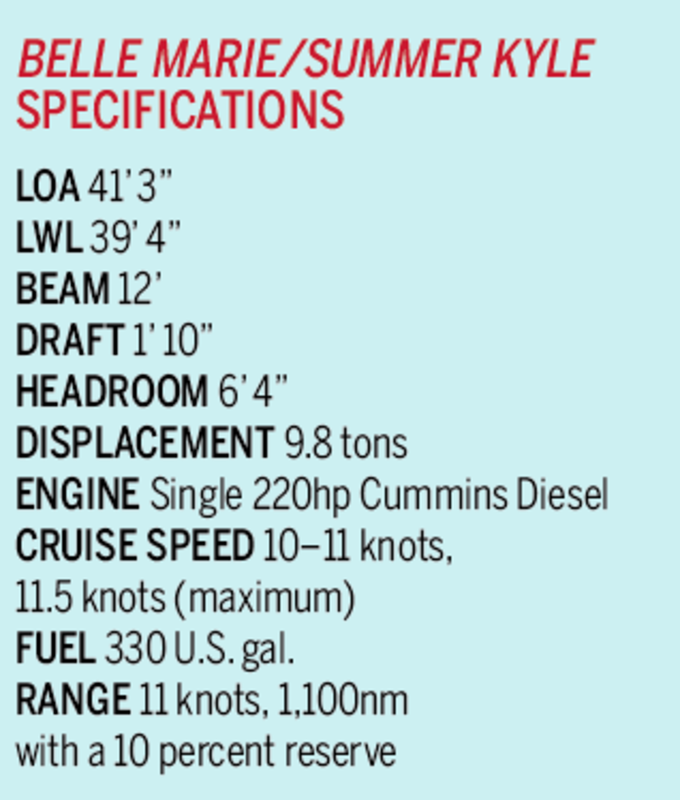 Summer Kyle—soon to be renamed Belle Marie—not only offered more amenities and greater range, but she had even less draft than their much smaller Albin had. What’s more, Summer Kyle’s (Belle Marie’s) armor-plated bottom and fully protected propeller and rudder made it possible for the owners to venture into waters where they were sure to ground out—and do so without a care. What could be more pleasant! Paul Bremer suggested that we rearrange the wheelhouse with a raised settee aft, so you could sit and look out of the windows. This provided the pleasant option of having breakfast or coffee in the wheelhouse with nearly 360 degrees of unobstructed visibility all around. I was also asked to try and think up a way to add a head to the aft cabin, which was soon done. Covey Island Boatworks was selected as the builder. Construction was wood-epoxy strip plank, sheathed in glass. This construction, by the way, can be lighter than most other methods. It is incredibly tough, at no weight penalty. Maintenance and longevity is comparable to, or even superior to, fiberglass. Belle Marie’s scantlings, in fact, make her about as strong and as tough as a ruggedly fashioned aluminum hull, at about the same weight. Yet, Belle Marie has the warmth and appeal only wood can provide. Her bottom—designed to take ground regularly in all conditions—is even stronger than comparable aluminum boats. With extremely heavy, closely spaced internal framing, her grounding bottom is 3 layers of 3/4-inch ply, fully sheathed and encapsulated in epoxy, covered with more than 60 ounces of bi-axial E-glass, surfaced with a 1/4-inch-thick stainless steel grounding plate, bedded on 3M-5200, and through-bolted with closely spaced stainless bolts. You could fire a .45 at it point blank and not get a hull puncture. 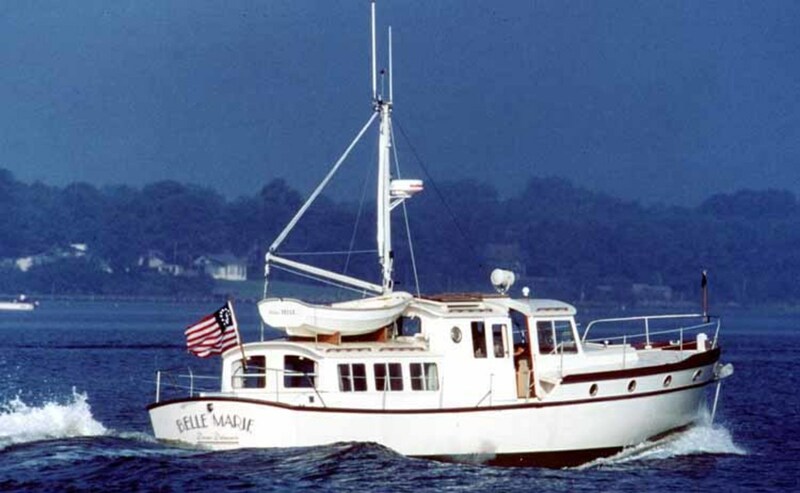 BelleMarie can take ground full tilt on coral or granite, with a steep swell running. In fact, this has actually happened to Belle Marie, with no problems at all. At launch, Belle Marie handled superbly, turning in just 1.5 times her own length at any speed. (She can just about be spun around in place during docking maneuvers—once you learn how.) Initially, steering response had been a tad more sluggish than ideal, but a fence added along the bottom of her rudder corrected this completely. Response is now so positive you can almost dispense with the bow thruster; however, the thruster is necessary—as she does skate sideways at docking speed in a cross breeze. (She doesn’t skate at all at cruising speed). She’s experienced very rough waters going offshore, and has proven exceptionally stable, soft riding, and comfortable. Her steadying sail—small as it appears—does an admirable job of damping out roll. 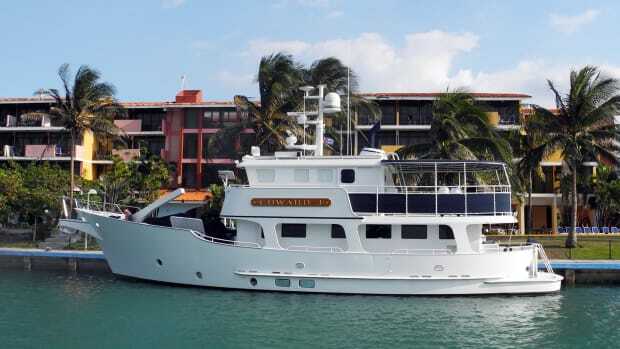 After nearly 20 years of serious cruising covering the entire East Coast from Nova Scotia to the Florida Keys, and much more, Belle Marie and her sister ships have exceeded all expectations for comfort and safety both inshore and offshore. BelleMarie cruises at a solid 10–11 knots, topping out at 11.5. At 11 knots, she consumes about 3gph, which—with her 330-gallon diesel capacity—gives her a range of 1,100nm, with a 10-percent reserve. This steady, continuous, comfortable cruising speed—11 knots on a 39-foot, 5-inch waterline—is quite unusual. It corresponds to a speed-length ratio of 1.75. This is true semi-planing performance. Yet at 11 knots, Belle Marie makes no fuss at all going through the water. She maintains level trim, throws no large wake, and in every respect behaves exactly as if she were operating at the standard displacement speed for this waterline of just 8.5 knots. In the years since Belle Marie/Summer Kyle was built, the original client did get his own Summer Kyle. His boat was named Twombly (now Moonbeam). 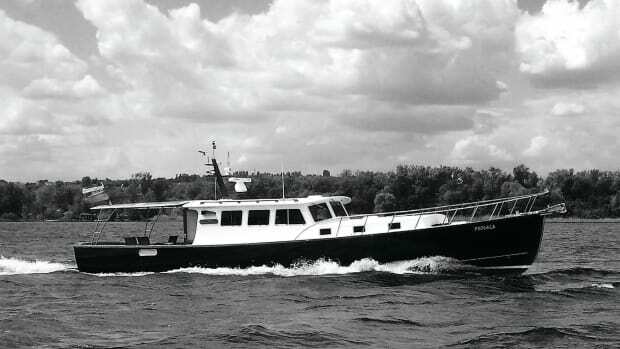 A 44-foot, slightly stretched version was built, as well as a 47-foot sister ship, Peregrine/Nancy Lakin, the 50-foot Kamarea, and the 76-foot Kestrel/Walrus. All have proven safe and superbly comfortable boats, with the ability to go into shoals where no other boats their size can venture. Boats such as these—economical, safe, comfortable, with extremely shoal draft and beachability—are ideally suited to the needs of most liveaboard cruisers. They are perfect for cruising the coast, doing the Great Circle, voyaging in the Caribbean, exploring rivers and bays, and shipping to Europe to cruise the canals. Dave Gerr is the director of the Westlawn Institute of Marine Technology, the oldest school of boat design in the United States, and the president of his design firm, Gerr Marine, Inc. He is the author of Boat Mechanical Systems Handbook, The Elements of Boat Strength, The Nature of Boats, and The Propeller Handbook, all published by International Marine/McGraw-Hill.